Now it's easier to find and track the stocks you care about using Milton's new Smart Watchlist! Today, Milton launched a personalized Smart Watchlist feature that uses artificial intelligence to help you invest better. On our homepage, login using the social account of your choice (Google, LinkedIn, or Facebook). Once you're logged in, search for stocks by name or ticker symbol to add them to your Smart Watchlist. It's that simple. Milton makes it easy to monitor prices, relevant news, and AI-driven insights about the stocks on your Watchlist. You're free to add and remove stocks whenever you'd like. 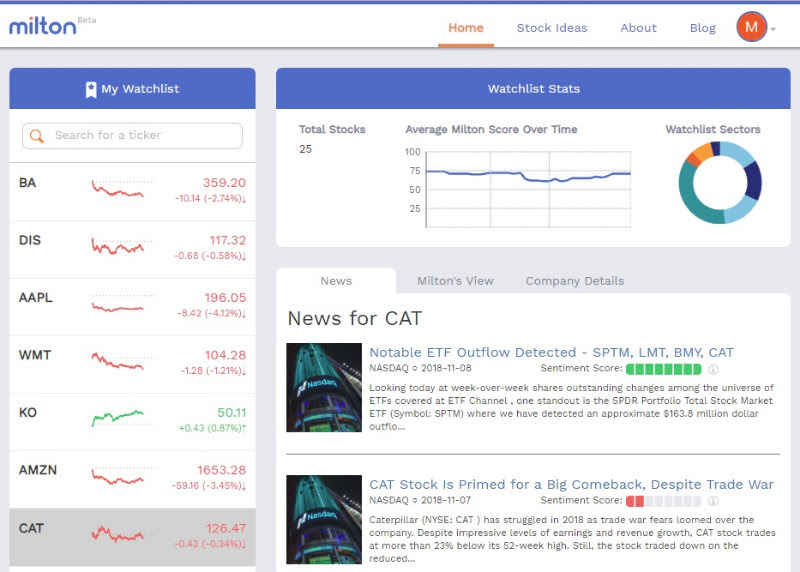 In addition to real-time stock prices and an easy-to-use interface, Milton’s Smart Watchlist uses the latest AI and machine learning techniques to provide additional insights for our users. All information is refreshed daily based on new information Milton reads every day. Time is valuable. Manage information overload and read what's most important. 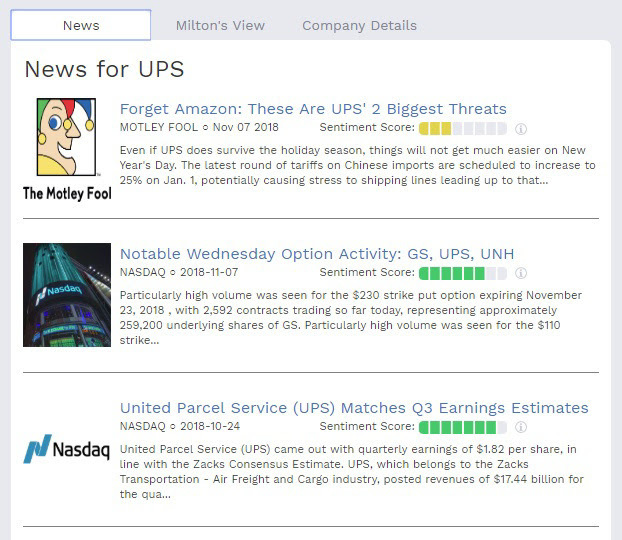 We leverage Milton’s proprietary natural language processing capabilities to surface relevant news articles about stocks on your Smart Watchlist, and measure Milton's Sentiment Score on every article. Milton’s entire library of insights on nearly 1,000 publicly-traded US stocks is now available exclusively to our users. Milton generates a daily score, Milton's Score, for each stock on your watch list. 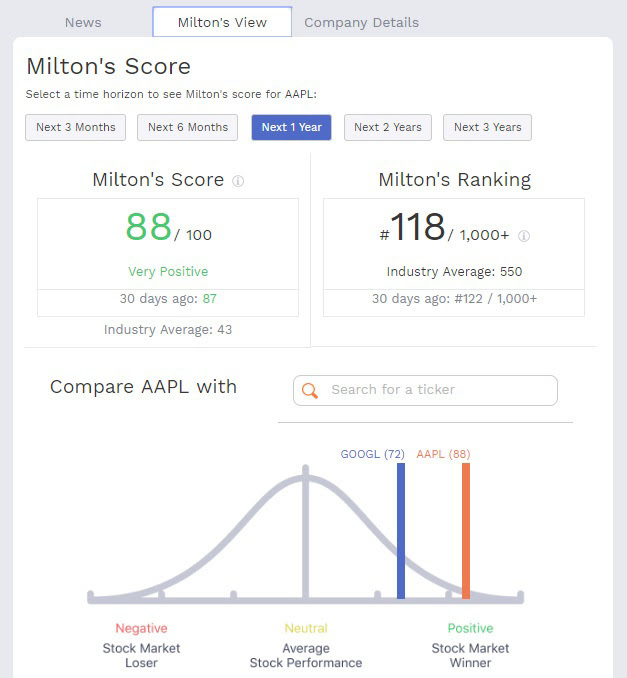 Play around and see how Milton’s Score changes depending on your time horizon, see how a company stacks up against it's industry peers, or compare a stock with Milton’s total universe. Review existing stocks, find new ideas, and more! Milton provides a score for your entire Smart Watchlist based on AI generated insights and machine learning. Use this knowledge to improve your portfolio or just to get smart about the 1,000+ US stocks in Milton's database. Our team of data scientists and engineers at Apteo is proud to rollout Milton's new Smart Watchlist. We built it specifically because our users asked for it.